Section 504 is part of the Rehabilitation Act of 1973, which is upheld by the United States Office of Civil Rights. This law protects access rights to public places and programs for individuals with disabilities. Accommodations that support access are guaranteed, and not providing access is a form of discrimination. All students with qualifying disabilities are part of a protected class under Section 504, including those on 504 Plans and those on Individualized Education Programs (IEPs). Section 504 protects a person with disabilities throughout life and covers individuals at work and in any public facility or program. Key terms are equity and access to opportunity. A government-funded place or program provides whatever is needed so the person with a disability can benefit from the place or program. The opportunity is equitable when supports provide a way for the person to overcome the barrier of disability (to the maximum extent possible) to access the place or program that everyone else has the right to access. A Section 504 Plan determines what a student needs to receive equitable benefit from school. Section 504 is part of a law called the Rehabilitation Act of 1973, which is upheld by the United States Office of Civil Rights. This law is about access–to a public place or program. Section 504 protects a person for life and allows every student, employee or guest in a public institution to ask for and expect supports and productivity enhancers–what they need to succeed. All children with disabilities who qualify for special services in school are protected by the provisions of the Rehabilitation Act. Students who qualify for Special Education are protected by Section 504 and the Individuals with Disabilities Education Act (IDEA). Children protected by IDEA have Individualized Education Programs (IEPs), and children who qualify for some support but do not meet the IDEA’s specific criteria may have Section 504 Plans. This article is primarily about Section 504 Plans. For more detailed information about the IEP, PAVE provides an article, Get Ready for School with IEP Essentials. Education rights are like a pyramid: At the top of the pyramid is the IDEA (Individuals with Disabilities Education Act), which provides a full menu of special education programming and services for qualifying students. 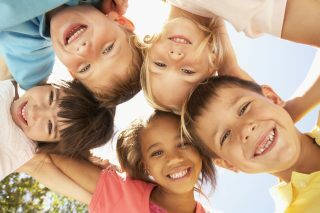 Children at the top of the pyramid have all the protections of each of these laws. At the center of the pyramid is Section 504, part of the Rehabilitation Act of 1973, which guarantees non-discriminatory rights to equitable access for individuals with disabilities. Schools are bound by Section 504 as “covered entities,” places or programs that receive money from the U.S. government. Schools provide access to Free Appropriate Public Education (FAPE) by helping students with 504 Plans to succeed in regular classrooms and school settings. The goal is to meet the student’s needs as adequately as the needs of nondisabled students to offer equity and access to opportunities. 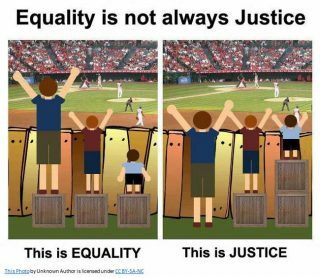 Keep reading to learn more about what equity truly means. Does the student have an impairment? Does the impairment limit one or more major life activities? 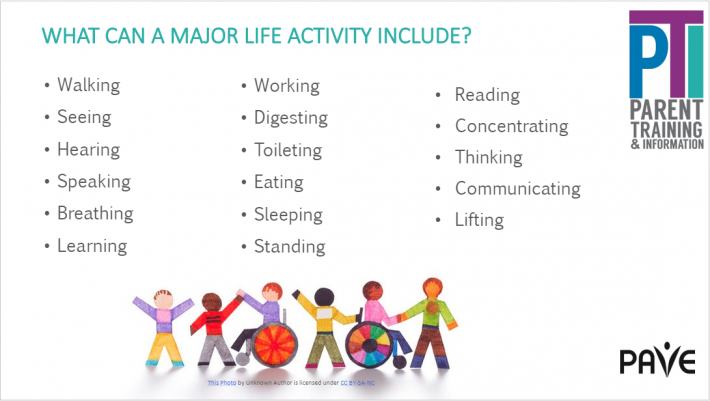 ​A list of major life activities is also endless. Whether an impairment “substantially” limits a major life activity is determined individually. Some impairments affect the ability to practice self-care, and challenges in basic life tasks like walking, seeing, hearing, speaking, breathing, learning, and working are captured. Someone with sensory challenges might struggle to concentrate, think and communicate—all of those can qualify as major life activities. ​Really, any system in the body might have a challenge that creates a barrier for an individual and therefore can qualify as a disability. The goal of a Section 504 Plan in school is to figure out what a student needs to be fully included and to receive equitable benefit from the government-funded program or service. Supports and services for a student with a disability seek to provide equity. Equal opportunity would mean that all students get the same help. Getting the same help doesn’t give all students the same opportunity. In this picture, on the left, the little guy in the light blue shirt can’s see the game, even though he’s got the same platform as the taller guy. ​He needs a different platform to have the same opportunity to see the game. The help that makes access to learning equitable puts the word Appropriate in FAPE– Free Appropriate Public Education. Under Section 504, individuals with impairments have a right to get into public places—with ramps, elevators, braille labels on doors…whatever is needed for physical access. Other aspects of access are less obvious. Individuals with unseen disabilities have the right to accommodations that will make a program or service as effective for them as it is for the general population. 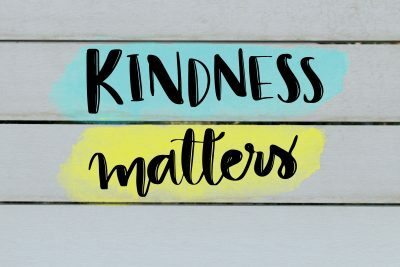 Positive behavior supports through a are an example of an accommodation that can help a student with a disability access the major life activity of learning. A BIP can be a stand-alone plan or can accompany a Section 504 Plan or an IEP. A BIP is developed after the school conducts a Functional Behavior Assessment (FBA). Parents sign consent for the school to conduct an FBA. Section 504 includes elements of inclusion. A person with a disability has the right to access the regular program unless special help and different options cannot work to provide that person with benefit from the program or service. This is important in education: Students have the right to get help so they receive an equitable benefit from learning in the general education classroom. They move to a more specialized setting only if those supports fail to provide appropriate and equitable access. ​This is true for students on 504 Plans and IEPs. According to the Office of Civil Rights, as an institution that receives government funding, a school is bound to avoid policies that might on purpose or accidentally exclude persons with disabilities. ​In other words, if a school’s policy or action creates a barrier to access for a student with a disability, the school might be cited for discrimination if the Office of Civil Rights did an investigation. ​Are Parents Part of the Section 504 Team? The Rehabilitation Act doesn’t require schools to involve family members in the administration of a 504 plan. However, the plan is managed by a responsible school staff member who notifies parents before a student is evaluated or placed on a 504 Plan and provides parents/guardians with a copy of the plan. The school also provides written notification to parents about their rights to disagree through grievance procedures. The document that describes these procedures is called “procedural safeguards.” ​If a parent requests a formal evaluation for special education services, and the school district refuses, the school district must provide the parent with a written copy of the procedural safeguards. How is a 504 Plan Different from an IEP? How are Discipline and Behavior addressed by Section 504? For a student with a Section 504 Plan, this meeting can also direct the school to conduct a comprehensive educational evaluation to see if the student’s disability qualifies that student for the full menu of special education options available under the IDEA—including an IEP.​ A website called School Psychologist Files has an article and a chart comparing Section 504 and IEP. 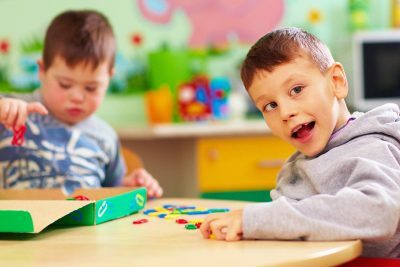 Special Education is provided through the Individualized Education Program (IEP) for a student with a qualifying disability. The first step is to determine eligibility through evaluation. This article describes that process. An article about IEP essentials is also available on PAVE’s website. Parents can request an evaluation by submitting a written letter to the school district. PAVE offers a template to help with letter writing. An educational evaluation collects information in all areas of suspected disability, including non-academic areas such as Social-Emotional Learning (SEL). Read PAVE’s three-part series on SEL for more information. See PAVE’s Part 2 article about what to do if the school says no to your request for a special education evaluation. If a student is having a hard time at school and has a known or suspected disability, the school evaluates to see if the student qualifies for special education. If eligible, the student receives an Individualized Education Program (IEP). Information collected during the evaluation is critical for building the IEP, which provides specialized instruction and other supports in a unique way for each student. A parent/guardian, teacher or school administrator can request an evaluation. A variety of tests and questionnaires are included. The evaluation looks for strengths and difficulties in many different areas, so input from parents, teachers and providers is critical. Generally, the evaluation reviews developmental history and assesses cognition, academic achievement and “functional” skills. Functional skills are necessary for everyday living, and deficits might show up in unexpected behaviors, unskilled social interactions or struggles with emotional regulation. Strengths are measured alongside challenges and can provide important details for a robust program. Nondiscriminatory Evaluation is a key principle of the Individuals with Disabilities Education Act (IDEA), which is the federal law that governs special education. The IDEA includes a mandate called Child Find, which requires school districts to seek out, evaluate and serve students ages Birth-21 who may have disabilities that impact school success or access. The mandate applies to all children, including those who go to public or private schools. Children who are homeless or wards of the state are included, as are children who move a lot. Children who are “advancing from grade to grade” are included in the mandate, if they may have disabilities that impact learning in non-academic areas of school. When a student is formally referred for an evaluation, the school follows a schedule of deadlines. Districts have 25 school days to respond to a written request for evaluation. Some schools will invite parents to a meeting to discuss concerns. Being prepared with a written statement can help. Parents can also share information from doctors, therapists or other outside providers. Parents can mark a calendar to track these timelines. Before a school evaluates a student, the parent/guardian signs consent. If school staff recommend an evaluation and parents do not agree or sign consent, then the school does not conduct the evaluation. Please note that parents are consenting to the evaluation, so that parents and schools can make an informed decision about what to do next. Parents can choose at the next step whether to sign consent for a special education program to begin. If a parent initiated the referral and the school doesn’t respond or denies the request for an evaluation, the parent can request an answer in writing. PAVE provides an article about what to do if the school says no to your evaluation request. Child Find mandates evaluation if there is reason to suspect a disability. Students who are failing or behind their peers might have challenges related to language or access to school that don’t indicate a disability. Parents who don’t understand the school’s reason can request a written explanation. Schools cannot refuse to evaluate because of budgetary constraints. They also cannot refuse because they want to try different teaching strategies. School staff might use the term Response to Intervention (RTI). Although the school might benefit from a review of its methods, RTI is not a basis for refusing to evaluate a child for a suspected disability. What happens next if the school agrees to evaluate? If all agree that an evaluation is needed, and a parent/guardian signs a formal document giving permission, then the school completes the evaluation within 35 school days. In compliance with the IDEA, an evaluation for special education is non-discriminatory. If the child cannot read, for example, the testing uses verbal instructions or pictures. The child’s native language is honored. Schools have a variety of tools available to eliminate bias. Parents can ask for clarification if they suspect that the testing missed its mark because of methodology. The IDEA requires schools to use “technically sound” instruments in evaluation. Generally, that means that the tests are evidence-based as valid and reliable, and the school recruits qualified personnel to administer the tests properly. The IDEA is clear that a singular measure, such as an Intelligence Quotient (IQ) test, does not meet the standard for an appropriate evaluation. Don’t be intimidated by fancy language! The formal language of the IDEA and the evaluation process can feel intimidating, but parents need to remember that they have a critical role as the experts and long-term investors in their child. If the evaluation data is confusing, parents can ask the school to provide charts or graphs to make it clear. Parents have the right to ask questions until they understand the evaluation process and what the results mean. A primary goal of evaluation is to identify a child’s strengths and needs in the general education environment. Regular classrooms are the Least Restrictive Environment (LRE) unless a student is unable to succeed there. The evaluation determines whether a student needs extra help in the general education setting, and the IEP team uses information gathered through evaluation to recommend an initial program. The IEP shifts and changes with the needs of the student, so the initial evaluation is only the beginning. A new evaluation is required by the IDEA at least every 3 years, but a new evaluation can be initiated earlier if there’s a question about whether the program is working. The school and family are always collecting new information and insights, and the IEP adapts in real time with new information. For example, the school might document that a student is failing to access learning in general education despite help that was carefully designed to make the setting accessible. Then the IEP team, which includes a parent or guardian, might discuss placement in a more restrictive setting. What if I don’t agree with the school? Parents can always ask school staff to describe their decisions in writing, and parents have rights guaranteed by the IDEA to informally or formally dispute any decision made by the school. The Center for Appropriate Dispute Resolution in Special Education (CADRE) offers a variety of guidebooks that describe these options. In Washington State, the Office of Superintendent of Public Instruction (OSPI) provides state-specific guidelines for dispute resolution. Does the student have a qualifying disability? Does the disability adversely impact education? Do the student’s unique needs require specially designed instruction? If the answer to all three questions is Yes, the student qualifies for an IEP and the protections of the Individuals with Disabilities Education Act (IDEA). Eligible students are entitled to an education designed just for them. That entitlement is for a Free Appropriate Public Education (FAPE). Every student in the United States has access to a public education for free. 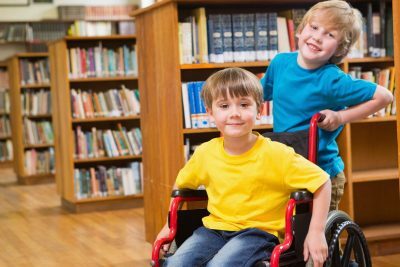 An educational evaluation determines whether a student is also entitled to an education that is “appropriate,” with unique help so the individual can make meaningful progress toward goals despite the circumstances of disability. Address your letter to the district’s special education director or program coordinator. You can deliver your request by email, certified mail, or in person. If you hand-deliver the letter, make sure to have your copy date/time stamped so you have a receipt. You can track the days the district takes to respond. The district has 25 school days (weekends and holidays excluded) to respond. The student’s full name and birthdate. A statement that “all areas of suspected disability” be evaluated. A complete description of your concerns, which can include details about homework struggles, meltdowns, grades, failed or incomplete assignments, and any other mitigating factors. Attached letters from doctors, therapists, or any other providers who have relevant information, insights, or diagnoses. Your complete contact information and a statement that you will provide consent for the evaluation upon notification. You can follow up if you don’t hear back from the district within 25 school days. When you provide consent for the evaluation, please note that you are not giving consent for your student to be placed in a special education program. You are consenting to the evaluation so that you and the school can make an informed decision about how to help your child succeed. Notify you, in writing, that the student has been referred for evaluation. Examine relevant documents from you, the school, medical providers, and other involved agencies. Tell parents/guardians in writing about the decision to evaluate or not. This formal letter is called “prior written notice” and is provided within 25 school days of the evaluation request. Request your formal written consent for the evaluation. Complete the evaluation within 35 school days after you sign consent. Schedule a meeting to share the evaluation results with you and determine next steps. Initiate development of an IEP, if the student qualifies. Sometimes a Functional Behavior Analysis (FBA) is conducted alongside an educational evaluation when behavior is a primary feature of a child’s difficulty at school. The FBA uses tools and observation to identify triggers and unskilled coping strategies that can help explain areas of need for learning. The FBA provides the foundation for a Behavior Intervention Plan (BIP), which supports positive choices. BIP goals and strategies prioritize social skill development and emotional regulation tools. The BIP can be a stand-alone document or can be used with an IEP or a Section 504 Plan (see below). Section 504 is part of the Rehabilitation Act of 1973 and provides for accommodations for individuals with disabilities that severely impact their ability to access a public building or a service, such as school. Sometimes students who don’t qualify for an IEP will qualify for special supports through a 504 Plan. 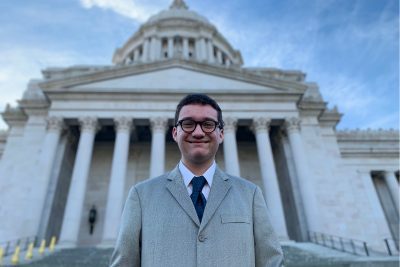 Disability is more broadly defined under this Civil Rights law, and a disability that impacts a “major life activity,” such as learning, can qualify a student for accommodations and modifications in school. If you disagree with the evaluation and/or the school declines to offer any support services, parents can pursue a request for an Independent Educational Evaluation (IEE). While a request for an IEE is not required to be in writing, a written request is encouraged because it documents the request (see letter guidelines above). When granting a request for an IEE, the school district provides a list of possible examiners and covers the cost. If the school district denies an IEE request, the district initiates a due process hearing within 15 calendar days to show that its initial evaluation was appropriate. Call 1-800-5PARENT (572-7368) and select extension 115, English or Spanish available, to leave a dedicated message. Go online to fill out a form to Get Help! Use the Google translate to make it to the language you use the best!